Environmental awareness is at an all-time high as more and more people express a concern for the environment. If you’re looking to make your home more energy efficient, you’ll be able to save money even as you reduce your carbon footprint. There are various things you can do to boost your home’s energy efficiency, and one of them is to install Newmarket, ON replacement windows. Read on for a look at some of the things you can do to boost energy efficiency. This is an easy one since it doesn’t mean having to buy anything. All you have to do is use your lights more responsibly. For instance, you can shut off lights in unoccupied rooms. You might be surprised at how much the savings can add up over time. If you want to up the ante, you can replace old incandescent light bulbs with more energy efficient varieties like LED bulbs, halogen bulbs, and compact fluorescent lamps. You’ll notice significant savings on your electricity bills. If it’s time to get new windows, ensure that your replacement windows have the Energy Star label. This designation will let you know how the windows measure up on the efficiency front. Consult with a replacement window company to look into the best windows available. You can get windows with special coatings, insulated frames, double pane or triple pane glass, inert gases inserted between the panes of glass for enhanced insulation, and more. If you have older appliances, you can bet that they’re not as energy efficient as newer options available today. Consider replacing them with newer brands that have the Energy Star label. Appliances with this designation will use a lot less energy, and this will reduce your utility bills. You can cut your monthly utility bill if you get in the habit of dialing back your thermostat by a few degrees. This should be particularly easy during times of the day when no one’s home. Unplug any technology that you are not using. If you plug stuff into the wall — whether phone chargers, computers, or TVs — they will draw power even if they’re not in use. There’s a term for this — energy vampires. So unplug stuff that you’re not using to reduce your monthly utility bill. 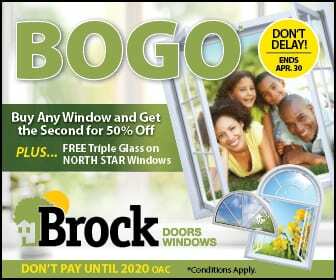 If your goal is to make your home more energy efficient, contact us at Brock Doors and Windows Ltd. We have the Newmarket, ON replacement windows you need for your residence. You can check out our Etobicoke location. We’re based at 486 Evans Ave Unit 11 Etobicoke, ON M8W 2T7. Also feel free to give us a call at (416) 255-9133. Our caring and professional staff are standing by to take your call and to help you get the replacement windows you need. We have a track record for helping people with their replacement window needs, and we’d be honoured to assist you with your home improvement project.